This year 6th Melbourne Cub Pack was very happy to join with 1st New Gibson and 15th Essendon Cub Pack to form Cuboree Pack 107. Leading up to Cuboree the cubs form the three groups got to know each other on two separate occasions. The cubs enjoyed an afternoon and night of fun on a sleepover at 6th Melbourne Hall. 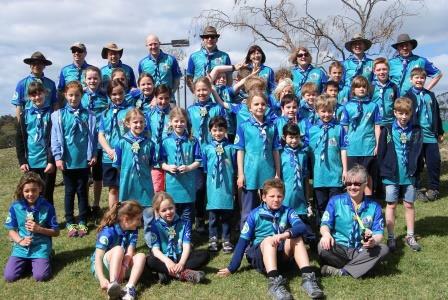 On the 13th September 22 cubs joined up at Days Picnic Ground for a wonderful and energetic 8.5km walk through the bush around Mt Macedon. The fun really began on the 29th September when 37 Cubs, 8 leaders and 3 parent helpers all boarded the bus bound for Cuboree Camp 107, Gilwell Park, Gembrook. That was just the start of 5 days of fun, excitement, mud, games, experiences and new friends. Great Activities, from Time Lords, Robin Da Hood, Cherry Lane, Scouts and Beyond, Far Far Away, Never Never , Six Sences and much much more. What a great week!! Thanks to all involved from Scout and Venturer volunteers, to parent helpers who assisted with camp setup and our three parent helpers who cooked for us (Dean, Philip and Fiona). A great week was enjoyed by all.